Are outdoor kitchens becoming a staple? You wouldn’t think of buying a home today without comfortable bedrooms, a kitchen, bathrooms, and a cozy living space. As technology and tastes evolve, so do expectations of what amenities are on the “must have” list for our homes. What features are on your must-have list? Indoor plumbing? Of course, don’t be ridiculous. Walk-in closets? Absolutely! A swimming pool? Sure. A game room? Perhaps. How about a separate home theatre room? Hmmm. A helicopter landing pad. Okay, that’s just ridiculous. One feature that has moved off the “ridiculous” list and closer to the “must-have” list is an outdoor kitchen. Outdoor kitchens used to be considered a luxury item, reserved for only the finest homes, but that is changing. Today’s outdoor kitchens are so much more than a shrine to an expensive grill. They include grills, sinks, side-burners, televisions, bars, ice makers, fire pits, fire places, wine coolers, kegerators, couches, water features, and more. With so many products available in an industry fueled by American ingenuity and imagination, the possibilities are endless and the price barrier is dropping. Developers and builders are adding restaurant and resort quality amenities to the backyards of homes of all price ranges. For example, Pacific Southwest Development has been building homes in the Las Vegas Valley for nearly 20 years, and is now including fabulous outdoor living areas and outdoor kitchens in nearly every home. 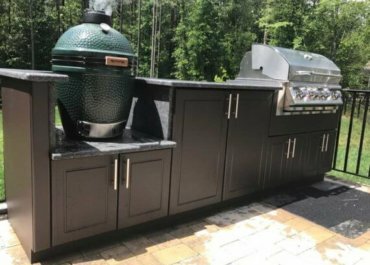 The outdoor kitchen trend is changing the American backyard into a private getaway destination that homeowners can enjoy every day. According to the National Association of Home Builders’ 2007 “Home of the Future Study,” industry experts predict at least one out of every five new houses built by 2015 will have an outdoor kitchen. So are outdoor kitchens a staple when buying a home? For more and more buyers, the answer is “yes”.